On the 26th January 2015 we were privileged to be able to ride at The Talland School of Equitation, Under the watchful eye of Pammy Hutton FBHS. The morning. Was split into Two groups both of which were able to ride in two sessions with a variety of horses ranging from youngsters to horses working advanced /Grand Prix. A tall horse, who took a lot to connect but an enjoyable ride nevertheless, lastly I had Amo who works at Inter1 and started one time changes again a great schoolmistress who could offer such education. Also in the group horse wise were Apollo generously loaned by yard manager Claire, and Abira who belongs to Pammy. It was an interesting day with Top Tips thrown in by Pammy at the end of each ride, her directions being clear and concise. A most interesting day thank you Pammy and the Talland Team, also to Jude and Jeremy for organising it . Report on F and I training day at Talland with Pammy Hutton FBHS. 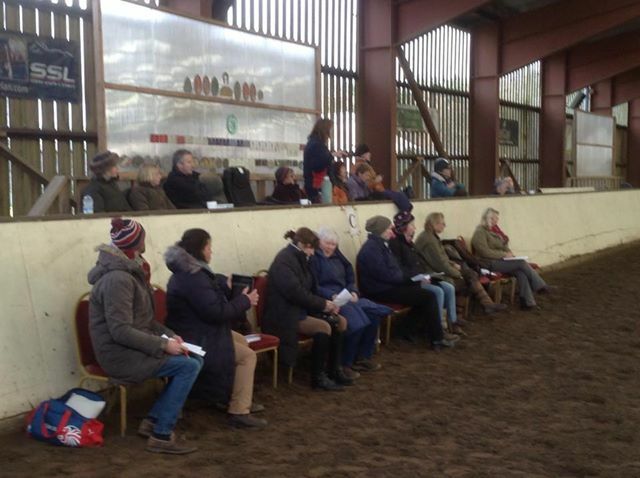 On Monday 26th of January, a training day was held at Talland, the first one to be held here since 2008. We were obviously in for an inspirational day – much catching up having to be done! Having recently completed her UKCC level 3 – Pammy was keen to show off her ‘newly acquired coaching skills’!!! The first group of four very brave riders rode a variety of horses, from a rather cheeky recently cut 5 year old to more established horses. “The Fellows meeting & Jan 30th unveiling of the plaque at the BHS headquarters was very impressive. I had no idea that I was only the 6th person to get it! I had my BHSI and couldn’t get any information about what was expected in the FBHS so thought the best thing was to go ahead & do it to find out how much more I needed to know, so I was not in the least nervous & thoroughly enjoyed it all and to my amazement I passed in November 1954. That was when Jo joined us at Addington Equestrian Centre and it was the first time she had seen her sculpture since she had crafted it for presentation to Malcolm Brown BHSI in 1989. The F&I Association has two tickets for this prestigious event. We always send two delegates, last year Carol Bennitt and Jillie Rogers attended and thoroughly enjoyed themselves. For further information, see the events page. Contact Judith Murphy asap if you would like to attend.